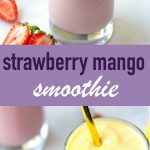 Try this super fruity and healthy Strawberry Mango Smoothie to start the day or for an afternoon recharge! 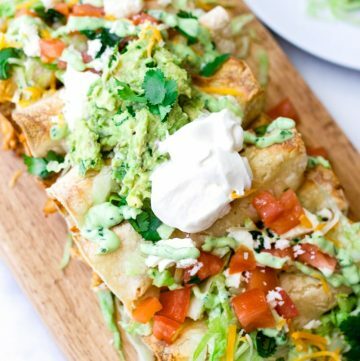 It’s full of healthy and refreshing ingredients. I love smoothies because they are so customizable. I make it whatever I want to satisfy my all my fruit cravings. Like I mentioned in my Mixed Berry Yogurt Smoothie post, I am 100% a fruit smoothie person. Kale and other greens smoothies are not my thing. Mangoes are one of my favorite fruits. And strawberries are just naturally delicious. 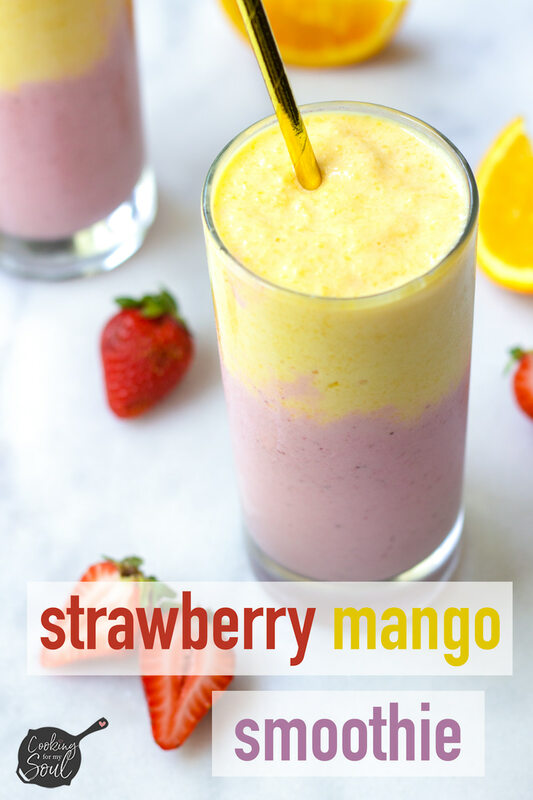 So what better than a smoothie made of these two wonderful fruits? Yup. 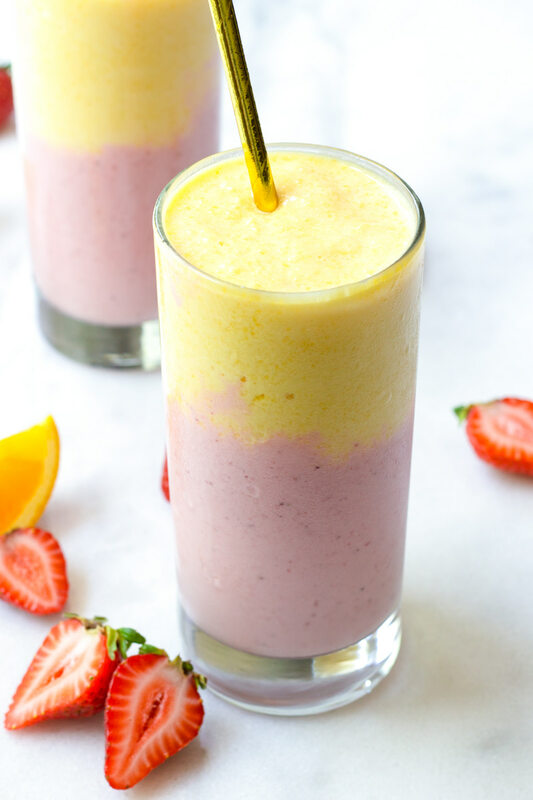 What’s In This Fruit Smoothie? That’s all! 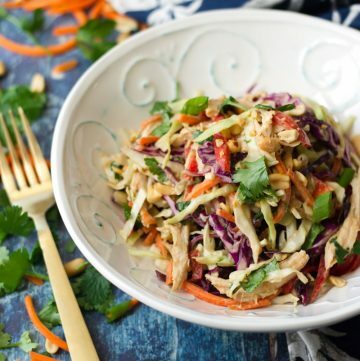 Super easy and healthy. 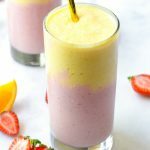 What do I Need to Make a Good Smoothie? Adjust liquids as necessary and to taste, and always start with less. You can always add but not remove. Invest in a good blender if you can. It will make a difference. I use the Ninja Professional Blender 1000. For creaminess, use something like yogurt or milk. Alright, so let’s get blending! And don’t forget to pin my recipe below 🙂 Thank you! Use frozen fruit for best results. If you don’t want to buy pre-frozen fruit, you can chop up your own fruit and freeze it overnight. 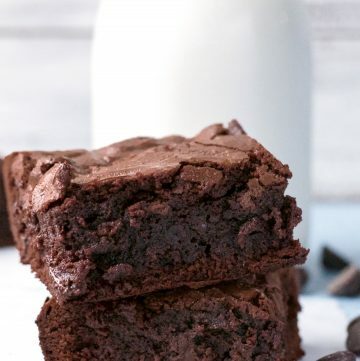 Try experimenting with any kind of milk you like! Almond, coconut, cashew, soy…If using thick coconut milk, make sure to thin it out. 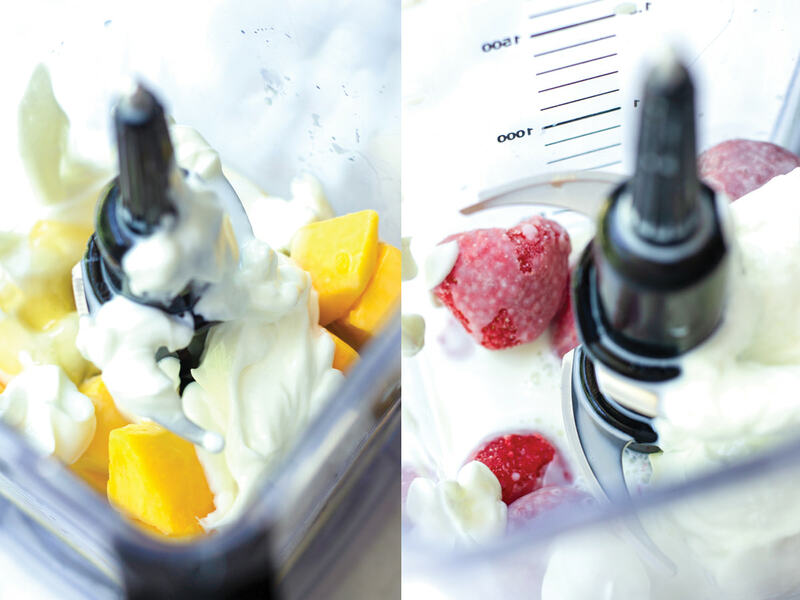 If the smoothie is moving freely in the blender, it likely means consistency is good. Check that it’s not way too thick. See above for additional smoothie tips! 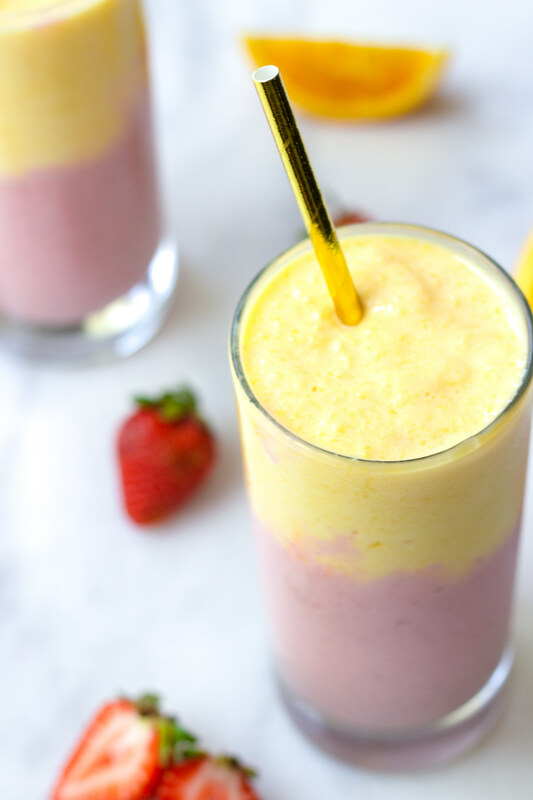 These strawberry mango smoothies are the perfect way to start your day or recharge in the afternoon! So healthy and fruity! Blend all the Strawberry Smoothie ingredients1. If desired, add more honey for extra sweetness. Blend all the Mango Smoothie ingredients1. 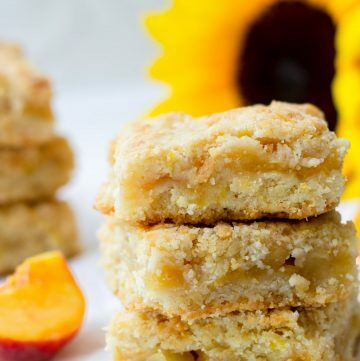 If desired, add more honey for extra sweetness. 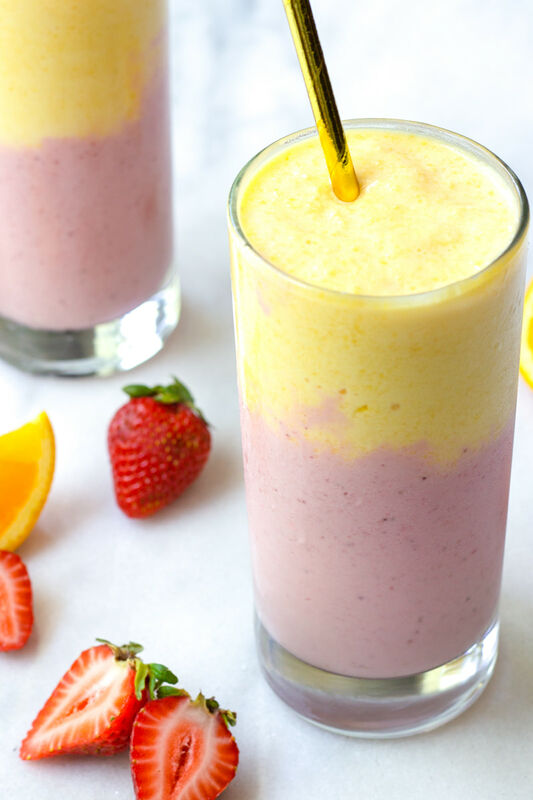 To serve, pour some of the mango smoothie on half of a glass. Then pour some of the strawberry smoothie on the other half. Enjoy! Start with less liquid and gradually add more as you are blending until desired consistency.